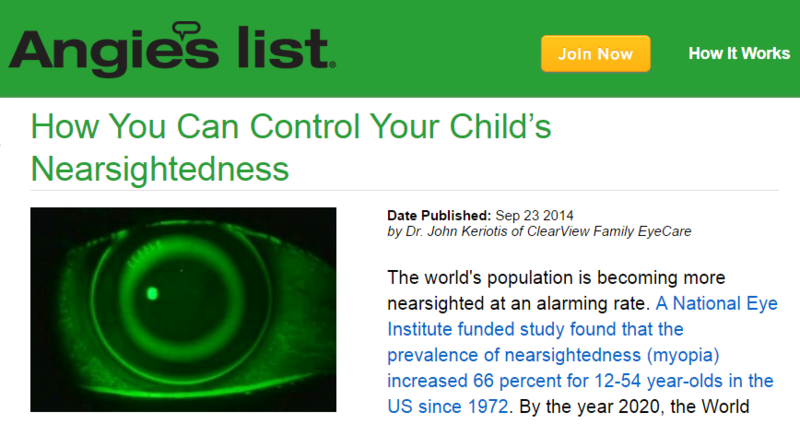 Dr. Keriotis' article on Nearsightedness Control was chosen as the winner of Angie's List "Expert" article. Click the photo below to read the full article. The world's population is getting more nearsighted. A study funded by the National Eye Institute found that the prevalence of nearsightedness(myopia) increased 66% for those aged 12-54 years old in the US since 1972. The World Health Organization predicts that half of the world's population will be nearsighted by the year 2020. For years it has commonly been believed that there is no way to stop the worsening of our children's vision. Eye doctors thought that genetics and eye growth pre-programmed our eyes as to how nearsighted we will become. Doctors(myself included) would tell parents that their child's eyes are going to continue to worsen until the eye stops growing and there is no way to stop it. In the meantime, thicker and thicker glasses or stronger and stronger contact lenses would be prescribed year after year. However, this rapid rise in nearsightedness around the world is occuring much too quickly to be explained by genetics alone. Science now tells us that something can be done to slow the progression of nearsightedness. The science of nearsightedness control has evolved rapidly over the last several years. There are now methods that can slow the progression of nearsightedness in children. Corneal Reshaping - The technical name for this procedure is orthokeratology but, it is referred to by many other names such as OrthoK, CRT, Corneal Refractive Therapy, Gentle Molding, Corneal Molding and Vision Shaping Treatment. The FDA-approved Corneal Reshaping program involves wearing custom designed eye retainers that are only worn while sleeping. The eye retainers gently reshape and mold the front surface of the eye while sleeping. In the morning, the retainers are removed. The changes to the shape of the front surface of the eye causes light to focus clearly in the back of the eye. Clear vision is maintained all day with no need for daytime eyeglasses or contact lenses. Therapeutic Nearsightedness Control Program - There is an eye drop that has been used for decades to safely treat various eye and vision-related conditions. Many studies have proven it can slow or stop the progression of nearsightedness. It has never been embraced by the eyecare community to control nearsightedness because it caused light sensitivity and blurred reading vision. However, recent studies have shown that a reformulated version of this drop has eliminated the side effects while still maintaining the effect of preventing nearsightedness progression. It is a safe and effective method of controlling nearsightedness. Daytime soft contact lenses for myopia control - These special soft contact lenses are worn during daytime hours just like traditional contact lenses. The optics of these lenses is thought to inhibit the progression of nearsightedness. Don't sit by idly watching your child's vision worsen. Schedule your consultation today to discuss which of these options is best for the needs of your child.